Chris Messenger's current research focusing on the positioning of E.L. Doctorow in multiple contexts of twentieth century American Fiction. His recent book is TENDER IS THE NIGHT and F. Scott Fitzgerald's Sentimental Identities (2015). He has long term interests in sentiment and sentimentalism, its discontents, sublimations, and relation to affect theory. His THE GODFATHER and American Culture: How the Corleones Became "Our Gane" (2002), is a primer of approaches to the study of popular fiction through an American popular "classic." 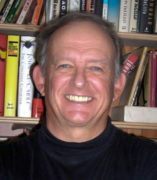 He is also the author of two books on Sport and Play in American Fiction (1981. 1990).